UNITED NATIONS (CNN) -- A United Nations report issued Tuesday says both Israel and the Palestinians committed actions amounting to war crimes during Israel's military incursion into Gaza from December 27 to January 18. 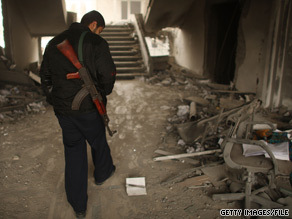 A member of Hamas walks through a building damaged during fighting with Israel in Gaza last January. Although the U.N. investigation found that Palestinian militants also committed war crimes, the overwhelming majority of the criticism in a summary of the 574-page report targets Israel. Israel "committed actions amounting to war crimes, possibly crimes against humanity," the report says. The findings were revealed by the head of the U.N. Fact Finding Mission on the Gaza Conflict, headed by Richard Goldstone, a South African judge. Israel did not cooperate in the investigation. The Israeli Foreign Ministry issued a statement saying Israel "did not feel able to cooperate with the Fact Finding Mission because its mandate was clearly one-sided and ignored the thousands of Hamas missile attacks on civilians in southern Israel that made the Gaza Operation necessary." Sami Abu Zuhri, a spokesman for Hamas, which controls Gaza, told CNN: "This report is evidence of the crimes committed by the occupation forces against Palestinian citizens." He rebutted claims in the report that Hamas militants also committed war crimes by saying that "the Palestinian factions were defending themselves, which international law allows them to do." The report claims that the Israel Defense Forces "failed to take feasible precautions required by international law to avoid or minimize loss of civilian life, injury to civilians and damage to civilian objects." The U.N. findings also conclude that Israel fired the chemical agent white phosphorous in civilian areas, intentionally fired high-explosive artillery shells upon hospitals, and failed to provide effective warnings to civilians or U.N. workers before attacks. It also claims that Israel used Palestinian civilians as human shields and deliberately attacked Palestinian food supplies in Gaza. The report recommends that the U.N. Security Council require the government of Israel to launch appropriate independent investigations into the findings of the report within three months. The findings also recommend that the alleged Israeli war crimes be explored by the International Criminal Court's prosecutor. The findings also call on Palestinian leadership to investigate alleged war crimes, for militants to respect humanitarian law, and for the release of Israeli soldier Gilad Shalit on humanitarian grounds.